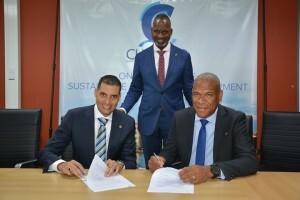 WILLEMSTAD - Last Monday, in the presence of the Minister of Economic Development Dr. Steven Martina, the public companies Curoil and Curaçao Towing Company (KTK) signed a Memorandum of Understanding. This MoU focuses on working towards a future collaboration for the transportation of oil products between Curaçao and other islands in the Caribbean. With the vast experience of both companies in the maritime sector and the distribution of oil derived products respectively, the parties foresee a future collaboration that will bring economic benefits. For KTK this will mean an expansion of their portfolio of its services. For Curoil this means that it will work with a local strategic partner in the area of maritime service which will bring more efficiency in the company’s chain of distribution. Picture: from left to right, Yamil Lasten (Curoil), Minister Steven Martina and Suldric Rojer (KTK).